Ron Kirk prefers classic truck shows over car shows. Ron’s 1964 Peterbilt on display at Harden. From a young age, Ron Kirk was into old cars and classic car shows. These days he’d much prefer truck shows, such as the Harden Truck and Tractor Show, especially with his 1964 281 Peterbilt he bought nearly 10 years ago. "I’ve been in the old car movement since I was about 12 or 13, and it was probably 15 or 16 years ago when I got involved in the trucks," Ron recalls. "I found I was having more fun with them than I ever was with the cars. It just became too competitive and too ego driven." Ron bought the old Pete direct from the United States. He’d been across around five times, and he had a good mate who knew all there was to know about shipping vehicles back to Australia. However, just as Ron was boarding the plane, tragedy struck. His friend’s wife had passed away and Ron was left to his own devices. "So I made some hasty phone calls to mates, and then rang Lynch’s in Newcastle," he says. "They’d bought a fair few Petes in and basically they talked me through it and gave me some phone numbers, right at the 11th hour. "I didn’t realise what was involved — it was an absolute nightmare. It’s not something I would recommend for the faint hearted. "There’s a fair bit of work getting one of these into a container." 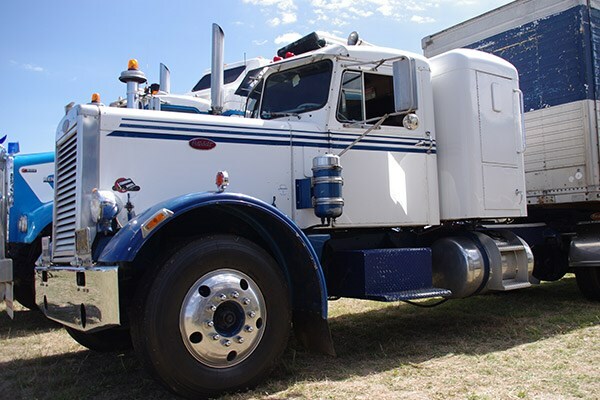 The Peterbilt is right-hand drive, but as it’s more than 30 years old, it’s able to registered in Australia as is. Ron is happy to have it on club rego only, especially now that the NSW Minister for Roads, Maritime and Freight Duncan Gay brought in a conditional registration trial. "We get to go to an event like this without having to fill out any paperwork as long as it’s a sanctioned event," he says. "With this truck now I can fill out a logbook sheet and drive it anywhere and do anything I want for 60 days. The standard conditions still apply, you can’t use it for commercial purposes." 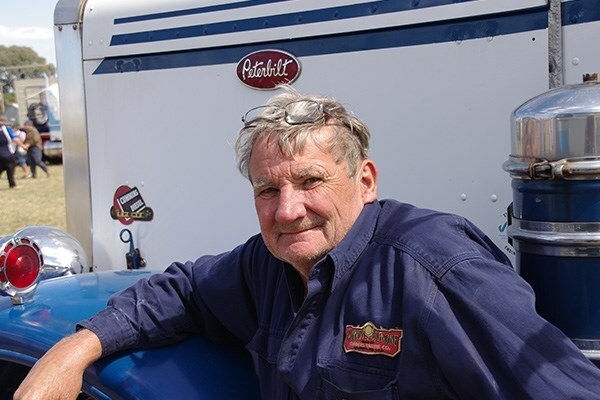 Since its arrival in Australia, Ron has taken the Peterbilt on tour to a number of historic truck events, including the first Haulin’ The Hume, where he was one of the organisers. It has also appeared at the American Truck Historic Society’s show in Echuca. And it’s the casual atmosphere, such as at Harden, which he enjoys. "That’s what I like about the old trucks compared to the cars; there’s no competition," he smiles. "You can get as many looks with something you’ve spent a fortune on as you can with something you’ve just pulled out of the barn that you’ve made mechanically right."